Just before the government’s partial shutdown EPA published a notice for public comment from Mercedes Benz requesting additional off-cycle credits. First, what are off-cycle credits? These are credits automakers can earn through the use of technology that reduce real world carbon emissions but are not captured under normal testing. Starting in 2014 automakers will use EPA’s preapproved menu for off-cycle technology credits (Table II-22—Off-Cycle Technologies and Credits and Equivalent Fuel Consumption Improvement Values for Cars and Light Trucks), which includes things like Solar Reflective Paint and Active Seat Ventilation. Automakers are also permitted to present their own data if they believe their technologies prove to be more valuable than EPA’s “pre-approved menu analysis “or if the agency doesn’t yet capture the benefits of the new technology. The notice listed four technologies Mercedes Benz claims will reduce their carbon emissions and that the automaker should be entitled to additional off-cycle credits towards their manufacturer's fleet average. Those technologies include Engine Stop-Start, High Efficiency Exterior Lighting, Infrared Glazing and Active Seat Ventilation. This was an interesting request. While the EPA’s Extended Idle Activity within the MOVES Model defines standard idle times for the purpose of emissions standards, Mercedes Benz decided to conduct their own study on idle times. The German automaker tracked 29 vehicles, totaling 311K miles, and determined that their cars on average idle 23.83% of the time they are in operation. Mercedes also obtained data from Progressive Insurance to support their claim. Progressive provided the automaker with data from Mercedes Benz vehicles enrolled in the Snap Shot program. This program allows drivers to plug in a small device to capture their driving habits and if they drive safe, reduce their insurance costs. The Snap Shot data said that of Mercedes Benz vehicles in the program they had an idle activity time of 23.9%. Interesting that Progressive shares (or sells?) their customer’s driving habits to a manufacturer to support a regulatory decision. This is also another standard measure captured under EPA’s approved menu and is worth 0.8-1.7 g/mi CO2 to the German automaker. This number can vary depending on the amount of glass and the performance of the glaze. In total this technology can net the automaker up to 2.9 g/mi CO2 for cars and 3.9 g/mi CO2 for trucks. 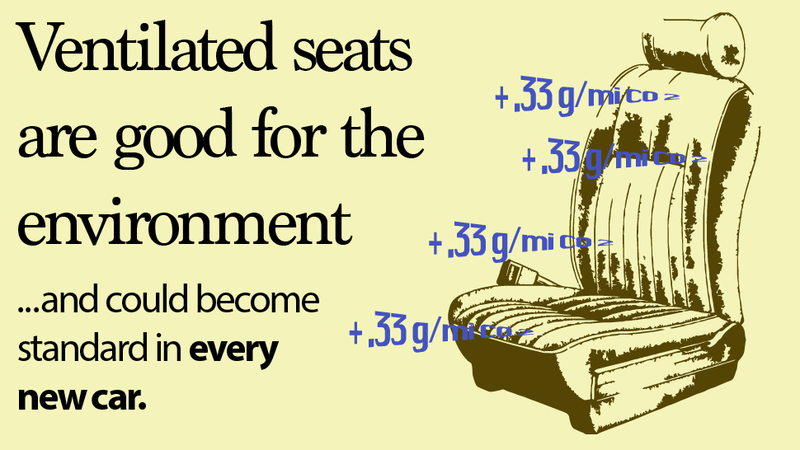 Yes, a luxury feature like cooled seats will net an automaker fuel economy credits. Mercedes Benz is asking to apply standard measurements developed for the 2014 model year to it’s 2012 vehicles in this request which would net the automaker a credit of 1.0 g/mi CO2 for cars and 1.3 g/mi CO2 for trucks. As you can see here these credits are minuscule, but packaged together they add up, totaling almost 23 g/mi CO2 depending on vehicle configuration. If automakers lean too much on advanced technologies to meet their carbon emissions standards, as opposed to actual fuel economy improvements, you can be assured that vehicle prices will increase dramatically. If your next Focus, Cruze or Corolla comes equipped with all the technology features listed in EPA’s preapproved menu, as opposed to an advanced internal combustion engine or transmission, we could see an increase in vehicle costs for technologies that many of us would consider superfluous. Also, if vehicle prices continue on their current trajectory, it would require even longer loan terms to maintain the current level of monthly payments. While ventilated seats won’t be standard any time soon, I expect to see more and more of these costly technologies finding their way into everyday cars. The question is will people be willing to pay for the premiums and will depreciation schedules allow creditors to extend loan terms beyond the current norm of 72 months.